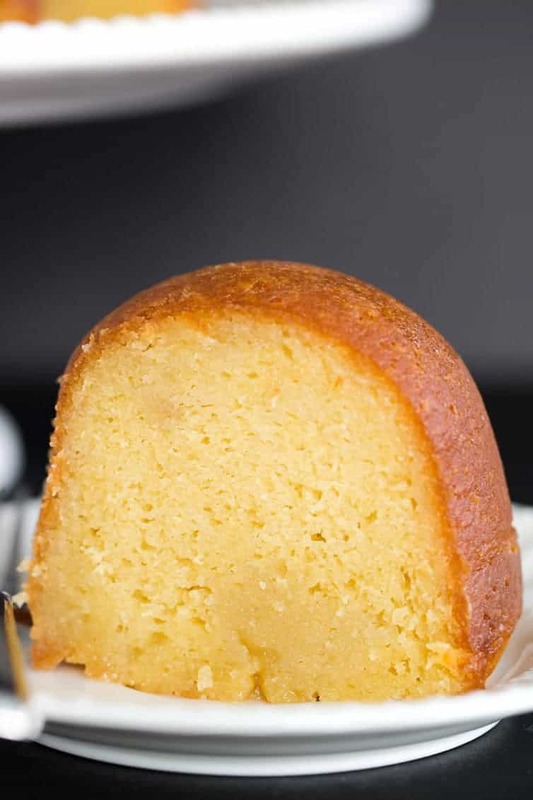 This rum cake is made completely from scratch, has the most tender, moist crumb, and is drenched in rum flavor without being overpowering. Perfection! Rum cake. A dessert that is nostalgic and old-school, and one for which just about everyone has a family recipe. Rum cake was one of a small rotation of desserts that showed up at my grandma’s house on Sunday afternoons. You could usually count on one of the following: rum cake, icebox cake, angel food cake with strawberries and whipped cream, or poor man’s cookies. There were some weeks that we made do with Klondike bars from the freezer, but for the most part we got to indulge in one of those four desserts. My great aunt made a killer rum cake that I could appreciate even as a kid. I remember it being so thick and moist, and of course, packed with rum. The problem I ran into is that my aunt always used a box cake mix, and all of the recipes I found online were the same, and I wanted a homemade cake. I finally found a recipe that I tweaked to rum-soaked perfection. 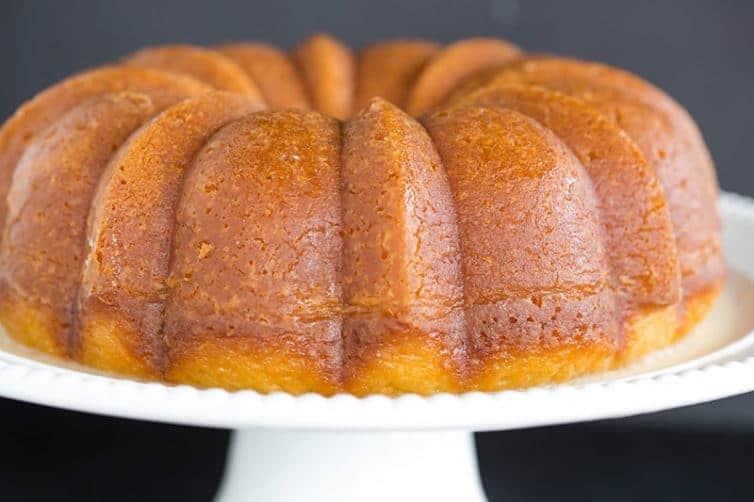 How to Make Homemade Rum Cake From Scratch! Since my husband’s birthday was last week, I had him pick our menu for Sunday dinner this past weekend. He chose calzones for dinner and requested rum cake for dessert. He has talked before about the rum cake that his grandma used to make and how amazing it was, but it’s been so long since I made this recipe that he had never tried it! I was hoping that it would live up to his expectations, and he LOVED it. He said that sometimes the rum flavor can be way too much, but that this was absolutely perfect. 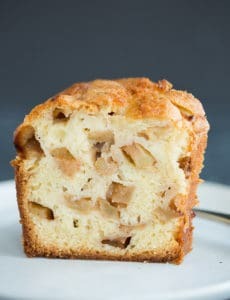 Tons of flavor but not overpowering, and the cake itself is so incredibly moist and flavorful. The key to the cake is twofold. 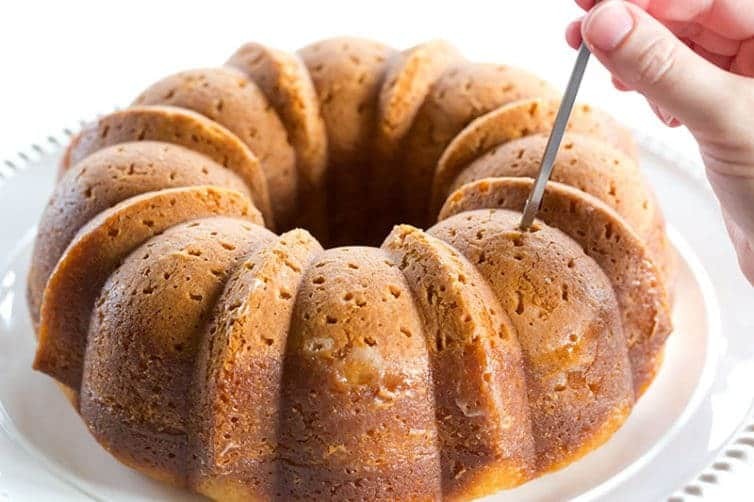 First, make sure that you aren’t shy when it comes to poking holes all over the cake when it’s time for the rum syrup. The more holes the better, as the rum syrup will have more places to hide in the cake, which means that it will soak into the cake more evenly, and won’t pool on the bottom of the serving plate. 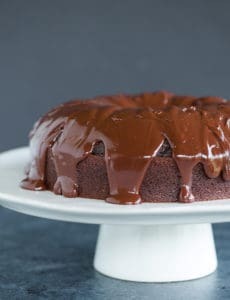 Secondly, when you drizzle the rum syrup over the top of the cake, you want to go verrrrry slowly so it has a chance to seep into all of those wonderful holes. In this instance, you want to be the tortoise, and not the hare. As you’d imagine, this gets better the longer you let it sit and soak, so you can absolutely make this cake a day ahead of time. Then behold all of the 100% homemade, no box mix, rum-soaked cake goodness! 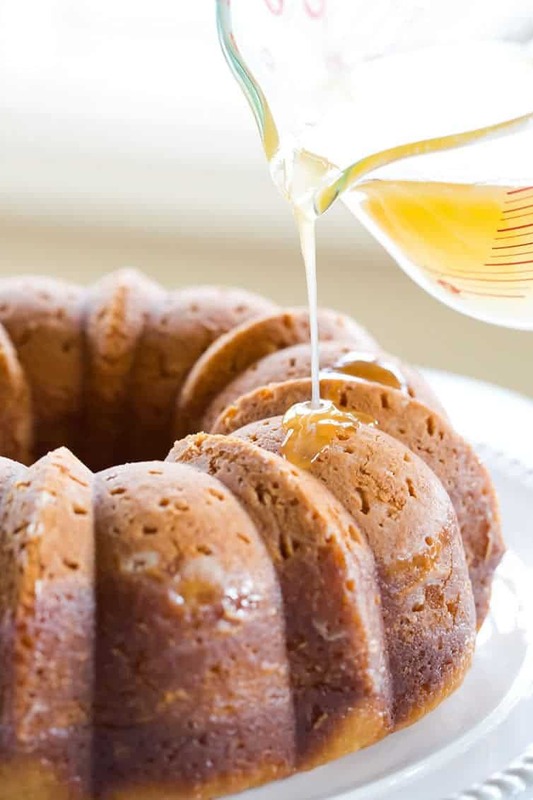 Make the Cake: Preheat oven to 325 degrees F. Grease and flour a standard Bundt pan (12-cup capacity). Sprinkle the chopped walnuts around the bottom; set aside. In a medium bowl, whisk together the flour, cornstarch, baking powder, and salt; set aside. Using an electric mixer on medium speed, cream together the butter and granulated sugar until light and fluffy, about 3 minutes. Add the flour mixture and the 3 tablespoons of canola oil, and mix on medium-low speed for 1 to 2 minutes - the mixture should look like wet sand. Add the pudding mix and mix again on medium-low speed until combined. Make the Rum Syrup: When the cake has about 10 minutes left to bake, start the rum syrup. Melt the butter in a medium-sized saucepan over medium heat. Once it is melted, stir in the sugar and the water. Boil for 5 minutes, stirring constantly. Turn off the heat and stir in the rum. Once it is mixed in, return the pan to medium heat for about 30 seconds. When the cake comes out of the oven, immediately pour about one-third of the rum syrup (approximately 2/3 cup) over the bottom of the cake. Pour slowly so it has time to seep into the cake. Let it sit for 5 minutes. Invert the cake onto a serving platter. Using a fork or a skewer, poke holes all over the cake - the top, sides, and around the inside. Don't be shy - all of the holes ensure that the rum syrup seeps into the cake evenly. Sloooooowly pour the remaining rum syrup over the top of the cake, allowing it to drip down the sides. You want to do this step very slowly (it took me almost 15 minutes) so that the syrup actually seeps into the cake and doesn't just pool on the bottom of the serving dish. Allow the cake to cool to room temperature before serving. Leftovers can be kept, tightly wrapped, at room temperature for up to 5 days. This recipe was originally published on April 18, 2012. I tried this cake for my husband’s birthday. Our guests included several elder women, known for their culinary skills. They loved it and so did my hubby! So glad I found this website. I’m making it again today. The only change I might consider is reducing the amount of alcohol… maybe for the rum syrup. Definitely would not serve to children! I also used a regular baking pan versus the bunting pan. Note the original recipe was excellent. My comments are just alternatives you might consider. I just saw this recipe. I’ve been looking so long for a really good Rum Cake recipe. My question is, can I use cake flour and if so what is the measurement? Thank you for sharing. I will try this soon. I love rum cake. This was really delicious! The first time I made it without the walnuts. Today I’m making it with toasted walnuts. My husband has been begging me to make it again ever since I made it the first time. Is there any way to substitute the milk for something else. My cake stuck to the pan and so have of it broke off. I greased and floured it… do not sure what went wrong. Maybe it needed to bake longer? (Toothpick came out clean but it was the shorter amount of time.) I’m just not sure. Any suggestions?? Use Pam for baking or Bakers Secret spray on pan. Cake comes away from pan beautifully. 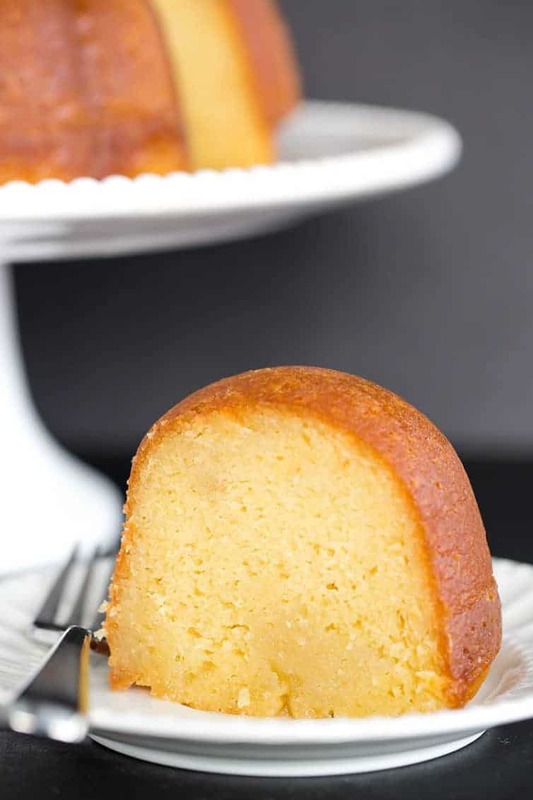 How do I adjust my rum cake recipe which I always made with an 181/2 0z cake mix to the new reduced size 151/2 cheaped down cake mixes? Or are there any companies still making the 181/2 size? I really hated the size change! I made this cake last night and it really is fantastic. I’m going ahead and giving it 5 stars even though I had a problem that is most likely my fault. My pour over syrup was grainy and formed a crystal like sugar crust on the cake. I did boil it the recommended 5 minutes. Any advice? Thanks for your rum cake recipe it really means a lot to me that you shared the recipe when you didn’t have to. You are reaching out to a people such as myself who is in need of a since of home! I am really touched in heart by this! For the rum cake, if I were to make mini loaf rum cakes, what temp should the oven be on and how long to bake for? Hi Michelle, Same temperature, but baking time will be less. Exact time I couldn’t say, as I haven’t made mini versions and many mini loaf pans are different sizes. Yesss! This was my first cake from scratch. I made it for Thanksgiving And I have to say it was Delicious. The ingredients was nice and simple. I love it. Thank you! I Will be making it again and again! GM, probably sleeping ! I am or was depending on your answer. bout to use your recipe brought everything I need according to the video. when I look up the ingredients. To prepare I see I need canola oil. Do you have use that particular oil? You can use canola or vegetable oil, both will work. Hi again! Will light rum work? And, by the way< I used your meatloaf recipe for my husband and youngest son, and they declared it the BEST meatloaf I ever made. Thank you. Hi Linda, Yes you can use light rum. And I’m so thrilled your family enjoyed the meatloaf! 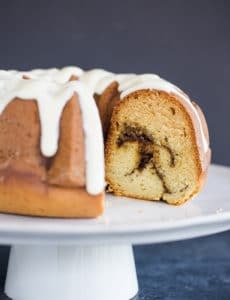 What would I need to do to revise this recipe into mini bundt cakes? I’d love to make these for Christmas gifts! Thanks for the wonderful videos! Hi Sharon, You are welcome! I think you could just divide the batter between your mini bundts (filling about 2/3 full). Obviously reduce the bake time, but I haven’t done mini’s so I couldn’t say what the exact bake time would be. Enjoy! Thank you very much for this recipe! Baked it inMy nordicware Bundt cake pan and substituted the rum with grand Marnier because I didn’t have any rum and am very happy with the result. Really moist and delicious. First time n your site. I’m here because I want to make a rum cake and I think your recipe is the best. Can coconut rum be used instead of dark rum? Hi Amena, Yes, absolutely! Enjoy! Yes if you prefer that liquor/flavor, then I think it should be fine. Can I get on your wonderful site? Thank you!!! Hi. I’ve been looking for a moist rum cake recipe from scratch and I found your recipe. I am from the Philippines and in our place, I can’t find any vanilla pudding mix. Would you have an alternative for this? I have baked this cake numerous times and it is always PERFECT! A bit of pooling with the syrup, but I don’t care. It is SCRUMPTIOUS! Moist and flavorful! From scratch? If you are adding a packet of instant pudding mix to the recipe, it’s isn’t really “from scratch” now, is it? As you can see in the list of ingredients, the recipe actually calls for homemade pudding mix, but I included the option of an instant packet because some people prefer the ease and convenience and they shouldn’t think that they’d be unable to make the cake if they chose not to make a batch of homemade pudding mix. I’m curious if I could make these into cupcakes for this weekend. Have you ever tried it? I could still poke holes in the cupcakes and pour the rum syrup over the cupcakes. Maybe frost with a rum buttercream and drizzle the rum sauce over that??? let me know what you think. Thank you! I’ve never tried it, but your idea sounds delicious! If you try it, let me know how it turned out! This cake is absolutely awesome! I am making another one for the 5th time! I followed the recipe exactly and I have to say that this was the best rum cake i have ever tasted . You can’t buy rum cake this good. Happy cook here and my husband raved about it as well.